Now is the best time of year to attract woodpecker families with fledglings out of the nest cavities and parents showing them where and how to find food. TreeNutty™ Plus Blend is a favorite of woodpeckers. It is loaded with chopped tree nuts,shelled peanuts and sunflower chips along with oil sunflower, striped sunflower and raisins. It also contains added calcium, an important ingredient that helps promote strong bones for fledglings. Offer it in a tube, hopper or tray-style feeder. Cylinders are the quickest, simplest, longest-lasting way to feed your birds. Nutty for Nuts is an irresistible blend of almonds, Brazil nuts, cashews, pecans, walnuts, roasted peanuts and added calcium. 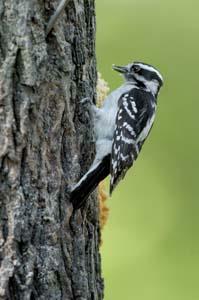 It is perfect for attracting nut-eating birds, such as woodpeckers, nuthatches and chickadees, to your yard. 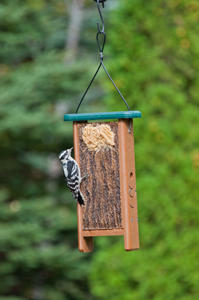 Offer it in the TreeNutty Woodpecker Cylinder Feeder. No single bird food attracts a greater variety of birds. Bark Butter comes in a variety of forms such as a spreadable suet and it comes in plugs for use in suet log feeders, suet cages or crumbled into tray feeders. A woodpecker wonderland, the Birdacious TreeNutty Woodpecker Feeder offers multiple foods in ways that woodpeckers prefer to feed. We’ve combined a resin bark panel, ideal for any flavor of Bark Butter, allowing the birds to cling and prop their tail as if they were clinging to a tree trunk. The hopper is perfect for offering TreeNutty Plus blend, Nutty for Nuts, Bark Butter Bits, peanuts or any other blend or seeds. Available in tree mount or hanging versions. Woodpeckers and other clinging birds like chickadees, nuthatches, titmice and wrens enjoy feeding from our EcoClean® Mesh Peanut Feeder. Ideal for a diverse option of enticing foods such as peanuts, Nutty for Nuts or Bark Butter Bits. The feeder also includes EcoClean product protection on the powder coated metal mesh, top and bottom along with the plastic diverter.